If the mountains make you feel alive, then don’t wait to discover Crystal Ski Holidays to take you there in style. Providing ski holidays in classic and sought after destinations like the Alps and Rockies, Crystal Ski Holidays will also let you discover some hidden gems in Finland, Norway and Bulgaria too. For a ski experience with a difference, you can trust the ski holiday specialists. With more than 130 resorts to choose from, the team at Crystal Ski Holidays aims to provide you excellence from the word go. As many of the staff work in the resorts and chalets themselves, they can give you all the details and find you the perfect match to your every holiday desire. Browse for a getaway by destination or ski area, discover the offering in ski apartments, luxury accommodation and much more. With holiday types like all-inclusive, solo ski trips, snowboarding holidays and more - however you like to enjoy the slopes - this leading holiday operator can take you there! Don’t wait to feel the excitement, check the Freshest Snow reports online and browse the blog to get you inspired about your next trip away! How do I use my Crystal Ski discount code? All discounts will be included automatically in the price, unless provided with a discount code to use at the checkout. For all the latest special offers, ski deals, inspiration and more - sign up to the Crystal Ski newsletter. Can I book travel insurance with my Crystal Ski Holiday? You will need to have winter sports cover before you leave, find more information about travel insurance here. Where is my closest Crystal Ski store? Visit the team and book in person at a Crystal Ski store near you. Can I make amendments to my Crystal Ski Holiday? Should you need to make a change to your booking, simply get in touch with the After Sales team on 020 8610 3123. If you booked in store, you should contact them directly. You will be sent your confirmations via email, and you can log on to your account up to 28 days before your leaving date to print/download tickets and travel documents. Should you need to amend or cancel a booking, get in touch with the team on 020 8610 3123. When you’re in search of the perfect winter getaway, Crystal Ski Holidays can create the perfect package for you. For the adventurous amongst us, the powder fiends, families and anyone who loves the freedom of the slopes, a Crystal Ski discount code will let you get heaps of fresh air and incredible views for less. With plenty of accommodation options and even non-skiing activities to enjoy - with Crystal Ski you’ll get your dream trip everytime. 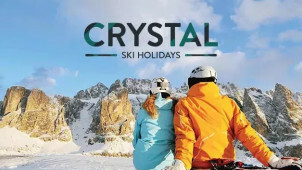 Crystal Ski Holidays has an incredible app that you can take with you when you’re off on your snowy holiday booked using a Crystal Ski voucher code from us. Crystal Ski Explorer lets you make the most of your time on the slopes, with snow reports and a comprehensive guide to resorts. Built by the experts and including cool features to enhance your ski holiday experience - be sure to download this to your smartphone before you leave! We like to get great value and variety with a Crystal Ski bundle. Here you can include extras like lift passes, snowboards or skis, and all for less with a Crystal Ski voucher code to help you save. Perfect for pros, and for those new to the slopes too; with lesson and tuition options for complete beginners and improvers - you’ll have no limits to your getaway with Crystal Ski.